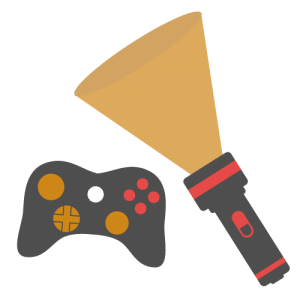 In the electronic age we live in, just about any device we use – from smartphones, alarm systems, to wall clocks and more – runs on a battery or two. Batteries have become ubiquitous that one hardly notices them – until they run out of juice. At this point, rushing to find a replacement is the first reaction. But what of the dead battery? For many, the answer doesn’t matter – but it should. A drained battery may be useless – but it’s not harmless. Batteries are not only portable sources of power, but of toxic waste, too. And if not disposed properly nor recycled, the poison they carry can seep into the environment unchecked, causing serious problems. In the US, lead-acid batteries such as those found in cars and trucks represent 2.8 million tons of municipal waste. American households, on the other hand, dispose 180,000 tons of spent batteries every year, with the majority being the single-use variety. 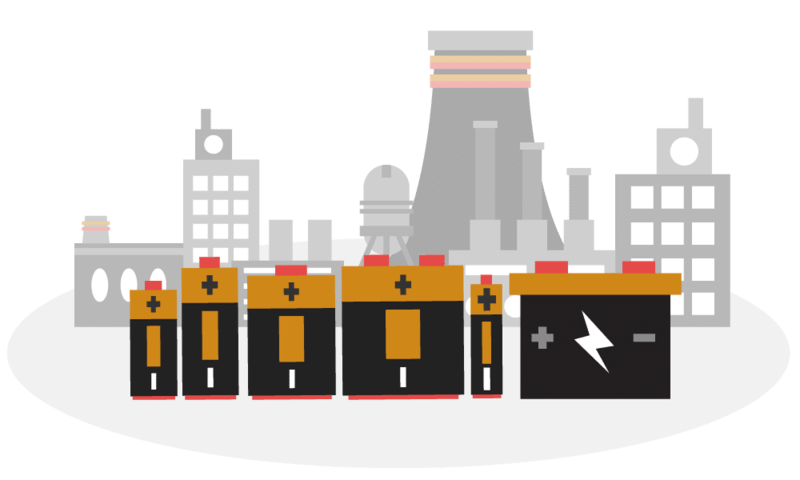 More than 1 million tons of automotive, industrial, and consumer batteries enter the European Union every year. The amount of battery waste we produce each year sure is staggering. But the impact? Even more so. Let’s take a look at how different batteries can put you and those around you at risk. Batteries have become a waste management problem because of the poisonous cocktail they contain. These chemicals, when released to the environment, can cause irreparable damage to the soil, air, and water, posing a major threat to wildlife. Should cadmium make its way into agricultural soil, it will harm beneficial microorganism and upset the soil’s balance. Cadmium can also accumulate in fish, damaging and rendering them unfit for human consumption. Alkaline batteries, on the other hand, are often mistaken for food by animals and can contaminate bodies of water. They also contain potassium hydroxide, a strong alkali may be harmless in minute amounts. But at 2% concentration, potassium hydroxide becomes corrosive and can damage any plant, bird, and land animal that comes into contact. To be fair, the 1996 Battery Act helped phase out mercury in batteries. Mercury is extremely toxic, and the WHO ranks it as one of the top 10 chemicals that pose major public health risks. Mercury exposure – even in small amounts – can damage the nervous, digestive and immune systems while causing developmental problems in children. Automotive batteries, on the other hand, pack sulfuric acid in high quantities. This highly corrosive and potentially explosive chemical can cause breathing difficulty and nasal irritation when inhaled, blindness, and even burn holes in the stomach when ingested. Cadmium, found in Ni–Cd batteries, is a bigger danger than lead when ingested or inhaled. The chemical has very low permissible levels of exposure, known to cause renal failure, reduce bone mineral density, and damage the respiratory system. Fortunately, most NiCd batteries have an airtight seal, though one must be careful when handling an exposed battery (and its leakage). Children as little as four years old may accidentally swallow button batteries, which can burn holes and leave permanent damage in the esophagus’ lining. In the UK, surgeons saw an increase of such cases, and children had to undergo complex surgeries for treatment. Batteries, whatever the shape or size, are a health hazard especially for the little ones. Careful handling during their lifespan is a must, while proper disposal and recycling are top priorities after they’re spent. In the next section, we will take a closer look at different battery types – along with some disposal and storage best practices. Contains: Zinc, manganese dioxide, potassium hydroxide. Used in: Smoke detectors, remote controls, kid’s toys. Americans purchase 3 billion dry-cell batteries every year to power up their flashlights, TV remote controls, and other gadgets. That’s a lot! Fortunately, modern-day single-use cells no longer carry mercury, which makes throwing them into landfills a lot more appetizing than before the 90’s. Just because you can throw away alkaline batteries along with your regular trash doesn’t mean you should. True, the single-use variety has a limited recycling market. But they contain a number of reusable materials. Not to mention recycling these batteries is pretty straightforward, too. Cities and communities often hold monthly household hazardous waste collection events. Some will collect those batteries for free, while others for a small fee. Check with your city government or website for the next event. Some places also have dedicated drop-off locations open everyday. But if you don’t have access to any of the services above, a mail-in program can work well for homes and small offices. These programs offer storage buckets or kits of varying sizes. After filling the bucket with dead batteries, just send the bunch back and they will take care of the rest for you. If you have to wait before you can bring the batteries to a recycler, be careful not to put too many of them together. Some dead batteries may still have some charge left in them and can trigger unwanted reactions with other batteries. Storing them in pockets is a big no-no and especially not near smartphones and other small gadgets. Instead, store them in a non-metal container. Don’t remove the battery’s label or pick the components apart. Doing so can damage the battery, causing leaks and burns. If a single-use battery is leaking, clean the mess with white vinegar or lemon juice to neutralize the alkaline. And don’t forget to put on protective gloves. Contains: Nickel oxide hydroxide and metallic cadmium. 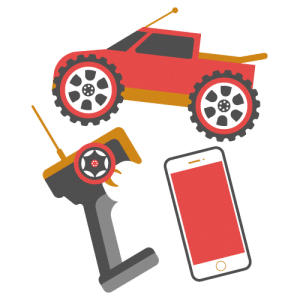 Used In: Cordless phones, RC toys, cordless power tools. NiCd batteries used to dominate the market for rechargeable batteries for home electronics. 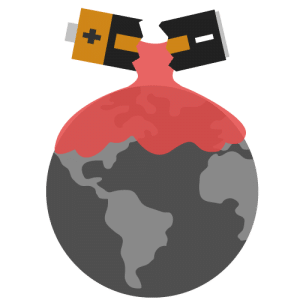 During the 2000s, the annual global demand for this variety reached 2.5 billion, with US consumers purchasing over 350 million nickel-cadmium batteries. These batteries are appealing because consumers can use them over and over again. And they pack enough punch to power up high-tech gadgets used on a daily basis, including laptops, digital cameras, and smartphones. But in 2006, the European Union’s Battery Directive restricted the sales of the nickel-cadmium type – and for good reason. Cadmium is a lethal metallic element, with kidney failure and stones topping the long list of health effects. Just recently, the Chinese government found cadmium contamination in rice paddles in Hunan, causing widespread concern. When disposed recklessly, the cell cylinder of the battery corrodes in the landfill, allowing cadmium to drain into the water supply. Unsurprisingly, oceans now show traces of cadmium, and things will only get worse every time a NiCd battery is tossed with regular household trash. Fortunately, nickel-cadmium batteries are 100% recyclable after collection, and national associations continuously work together to promote their recycling. 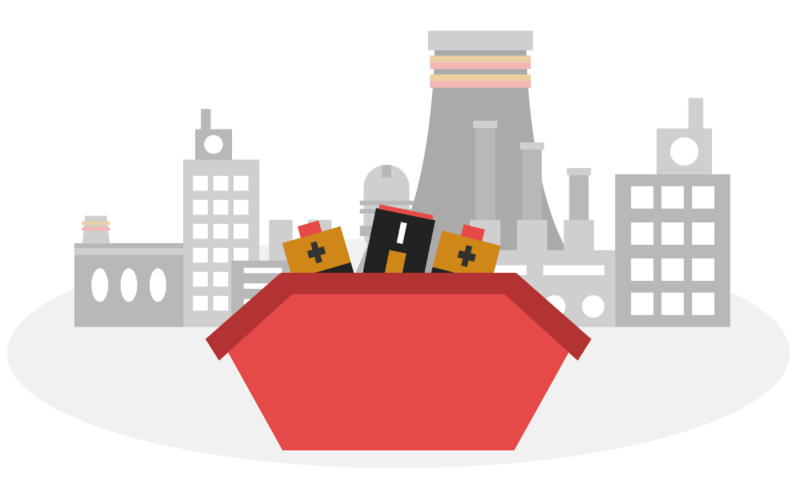 In the US, many state laws prohibit NiCd batteries from landfills but only a handful require take-back programs. Only in 4 of the 10 largest cities in the United States mandate these manufacturer programs. If a take-back program isn’t available in your location, you need to find a suitable drop-off location for those dead batts. Watch out for leaks when collecting and storing NiCd batteries for recycling. You don’t want to come in contact with the battery’s electrolyte as this solution is corrosive, causing serious burns. If any discharge from the battery makes its way to your eyes, flush and wash the eyes with clean water. Speak to a doctor right away as the chemical contents of an NiCd battery can damage the eyes and may even lead to loss of sight. Disassembling NiCd batteries is never a good idea. Doing so can cause a short circuit or release the contents into the air and trigger chemical reactions. If you have to handle and store damaged batteries, be sure to wear protective gears for your hands and eyes. And keep the batteries in a non-metallic container before taking them to a drop-off location. 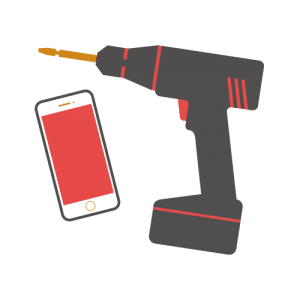 Used In: Smartphones, tablets, power tools, and electric vehicles. 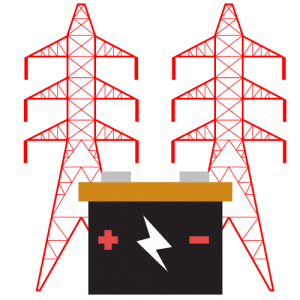 The lithium-ion battery is one of the relatively recent additions in the rechargeable technology market, with dozens of applications across different industries. Li-ion batteries are safer than other varieties but are banned from landfills all the same. For starters, li-ions can easily overheat and explode under hot temperatures. Not to mention they are pricier than nickel–cadmiums, so letting them stay in landfills makes little sense. Fortunately, disposing and recycling li-ions is easy. Majority of the time, the company that distributes your electronic device will also be accepting the battery for recycling. Most gadget and phone accessory stores also have a drop-off location, so check with your local retailer for details. When intact, lithium-ion batteries don’t require any special care or equipment. You can cover the terminals with insulation tape to prevent a short circuit, but that’s about everything you need to do. But if they’re damaged, you want to wear personal safety equipment (ex: gloves, safety masks, breathing protection) before sorting them for recycling. 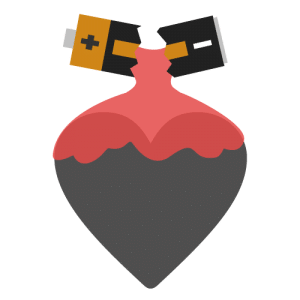 To prevent the electrolytes from leaking into the environment, store the damaged batteries in an airtight plastic container with dry sand or chalk powder added. Should the electrolytes get into your eyes or skin, give the affected area a thorough washing with clean water for 15 minutes. If accidentally swallowed, rinse out the mouth and the surrounding area with water. But whichever the case, always contact a doctor. Contains: Lead, sulfuric acid, EDTA, and additives. Used in: Vehicles, backup power supply, and grid energy storage. Lead-acid batteries juice up a massive portion of the transportation sector, including boats, private cars, motorcycles, and even golf carts. These batteries are one of the biggest health and environmental hazards around, so state laws have made it easy for consumers to get them to recyclers. 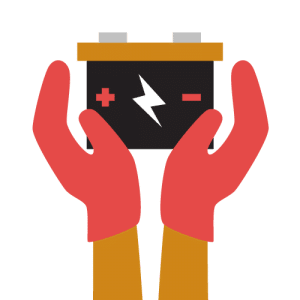 Stores that sell new lead-acid batteries can also take and recycle your old lot, and different local car supply stores and retailers also offer recycling programs. In some places, household hazardous waste facilities are open 24/7 and ready to accept lead-acid batteries for recycling. Communities may also open drop-off locations and collect waste once or twice a month for a small fee. The result of these initiatives? More than 90% of lead-acid batteries are recycled, while reusing over 98% of their material. 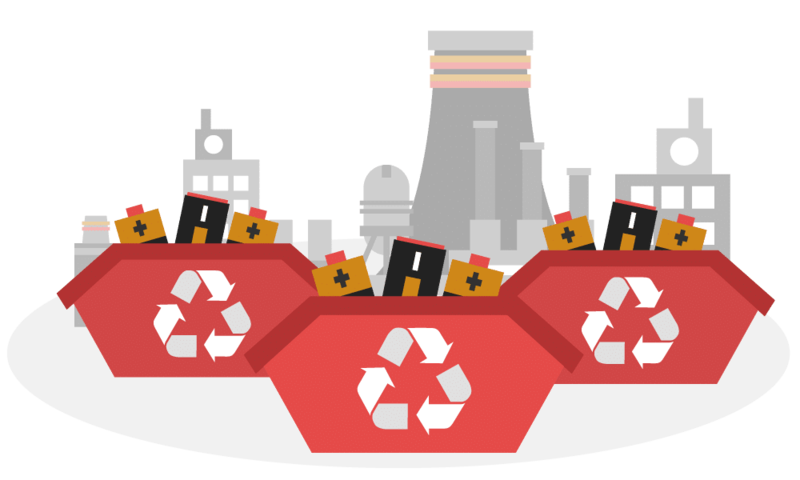 When recycling lead-acids, recyclers separate the three main components first: lead, plastic, and sulfuric acid. The batteries are crushed into tiny bits to collect the plastic parts, which are sent off to a reprocessor for creating new plastic products. The lead component, on the other hand, is sold to battery manufacturers to make new batteries. Today, new lead-acid batteries are composed of up to 80% recycled materials. When removing a lead-acid battery from a car, make sure the lead cables stay attached. You should also check for leaks before taking further action. If the battery is leaking, put it in a leak-proof container right away before taking it to the recycler. You can get one at most automotive supply stores. Be careful where you put a leaking lead-acid battery as the acid can eat through the concrete and damage the immediate surroundings. If you need to put it down, keep it upright and put it on a sealed asphalt surface so the acid doesn’t spread. If you’re taking more than one lead-acid battery to a drop-off site, keep the post terminals away from each other by separating them with a piece of wood. Contains: Nickel oxide hydroxide, hydrogen-absorbing alloy. Used In: Hybrid cars and consumer electronics. NiMH have replaced NiCd in many roles within the rechargeable battery market. 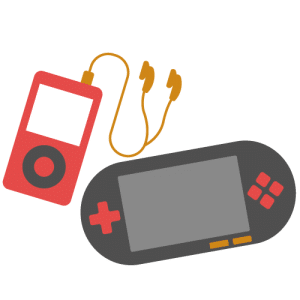 They work great for consumer electronics that use up a lot of power like handheld game consoles, toys, MP3 players, and more. Even better, they’re safe enough to mix with regular trash. However, NiMH batteries still contain metals that can harm one’s health and the environment. Nickel, for example, is a known carcinogen and can cause heart disease, high blood pressure, along with kidney and liver damage. You shoudn’t throw away NiMHs just because you can. While policies and recycling programs may differ from one state to another, the number of collection sites in the US (and beyond) are growing. Check with your city government’s website to stay up to speed and find a suitable drop-off point for your spent NiMH batteries. And since NiMH batteries are not classified as hazardous waste, some solid waste management departments can take them. Enough NiMH batteries coming into contact with each other can trigger a fire. So use multiple containers to keep them from bumping across each other. You also want to tape the positive side, the bumpy end of single batteries, for extra safety. If you’re using battery packs, check the device it’s in to find the positive side. Careful handling of leaky batteries is par for the course. To clean any leakage, Duracell recommends using a tablespoon of boric acid in one gallon of water or a 50/50 mixture of diluted vinegar or lemon juice with water. Use a toothbrush or cotton swab to clean any leakage. The recycling process kicks off by categorizing the batteries. Collectors place nickel-cadmium, nickel-metal hydride, lithium-ion, and lead-acid batteries into their designated containers. Recyclers remove the insulation, plastic components, and combustible materials using a gas-fired thermal oxidizer. The processing plant’s scrubber then cleans the pollutants, leaving only the clean and naked cells with metal content. The cells are then chopped into tiny pieces and heated until the metals liquefy. Non-metallic particles burn off, leaving nothing but a black slag at the top. The alloys settle based on their weights, and the recyclers skim them off still in liquid form. Since cadmium is very light and vaporizes at extremely high temperatures, a fan blows the cadmium vapor into a vast tube, cooled with mists of water. The vapors condense to yield 99.95% pure cadmium. Some recyclers don’t separate metals on their site, placing the liquid metals instead into pigs, hogs, or nuggets. These are shipped to metal recovery plants for manufacturing chromium, nickel, and iron for stainless steel and other high-end metal products. Consumers cannot recycle them on their own. They’re not like other pieces of scrap which you can repurpose and reuse using nothing but a few household items. People have to go out of their way and take their spent batteries to a collector. Call2Recycle Locator: Call2Recycle runs the first household battery recycling program for the US and Canada – and they’ve been running it for 20 years and counting. Just put in the state you want to search in, apply the necessary filters (ex: accepts single-use batteries), and the locator does the search for you. Earth911 Recycling Search: Earth911 is an all-things green online portal for businesses and consumers. 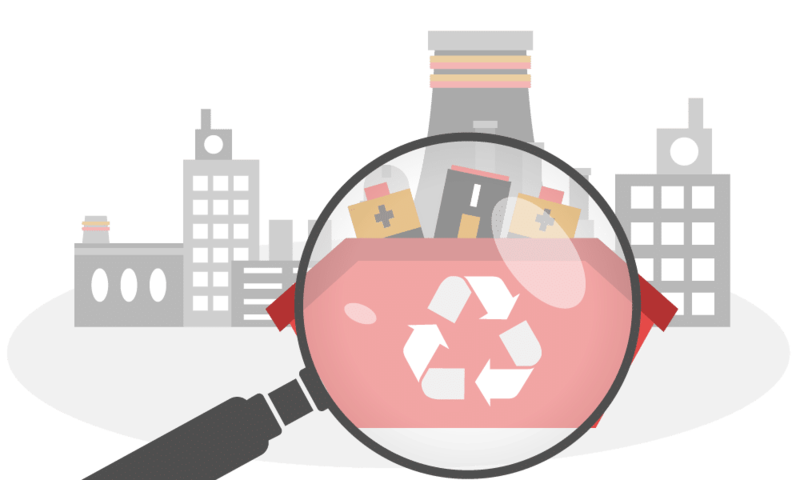 Their recycling database boasts over 350 materials and more than 100,000 listings within the US. Battery Association Of Japan: BAJ maintains the nation’s rechargeable battery collection program. The battery recycling and disposal section not only contains a searchable database of drop-off locations, but also educates readers about different battery types and best practices to follow. 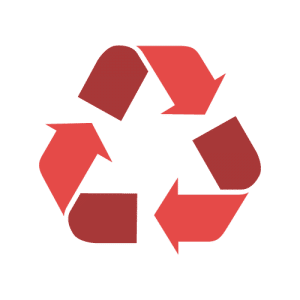 Recycle Now: For readers in the UK, Recycle Now has an intuitive and easy-to-use recycling locator. Simply tick the “batteries” check box, enter your postcode, town, or city, and the system will return a list of collectors and recycling stations nearby. Batteries may be the most toxic devices we have come to depend on. Life without them would be miserable, but living around them can be dangerous. And we’d have to live with this irony until we can find a better, eco-friendlier source of portable electricity. Until then, we have to ensure the batteries we use are disposed and recycled properly to minimize the health and environmental risks they bring.